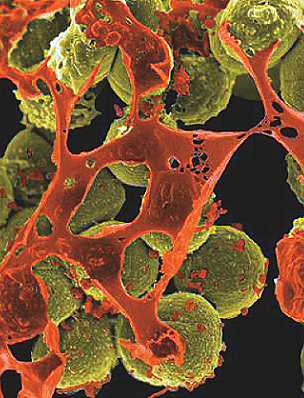 A potentially deadly "superbug" resistant to antibiotics infected seven patients, including two who died, and nearly 200 others were exposed at a Southern California hospital through contaminated medical instruments, UCLA reported Wednesday. A total of 179 patients at Ronald Reagan UCLA Medical Center were exposed to CRE during endoscopic procedures between October and January, University of California, Los Angeles spokeswoman Dale Tate said. The bacteria may have been a "contributing factor" in the deaths of two patients, a university statement said. Similar outbreaks of Carbapenem-Resistant Enterobacteriaceae (CRE) have been reported around the nation. They are difficult to treat because some varieties are resistant to most known antibiotics. By one estimate, CRE can contribute to death in up to half of seriously infected patients, according to the national Centers for Disease Control and Prevention. The bacteria can cause infections of the bladder or lungs, leading to coughing, fever or chills. 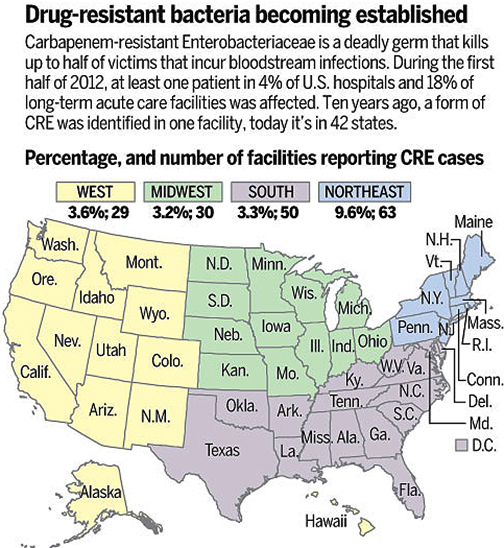 CRE infections have been reported in every state except Idaho, Alaska and Maine, according to the CDC. UCLA said infections may have been transmitted through two endoscopes used during the diagnosis and treatment of pancreatic and bile-duct problems. "We notified all patients who had this type of procedure, and we were using seven different scopes. Only two of them were found to be infected. In an abundance of caution, we notified everybody," Tate said. The two medical devices carried the bacteria even though they were sterilized according to the manufacturer's specifications, UCLA said. "We removed the infected instruments, and we have heightened the sterilization process," Tate said. 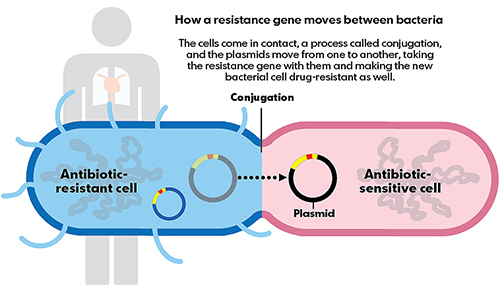 Potentially infected patients are being sent free home-testing kits that UCLA will analyze, the university said. A similar outbreak occurred in Illinois in 2013. Dozens of patients were exposed to CRE, with some cases apparently linked to a tainted endoscope used at Advocate Lutheran General Hospital. The hospital later changed its sterilization procedures. A Seattle hospital, Virginia Mason Medical Center, reported in January that CRE linked to an endoscope sickened at least 35 patients, and 11 died, although it was unclear whether the infection played a role in their deaths.